Sir Joshua Reynolds, the eighteenth-century portrait painter, was born in Plympton, Devon, on 16 July 1723. Throughout his life he maintained strong associations with his birthplace and the surrounding areas of Plymouth and Devon. Through his portraiture and writings, Reynolds became a pivotal figure in the development of the British School of painting. He became the first president of the Royal Academy of Arts (1768), knighted by George III (1769), and became Principal Painter in Ordinary to the King (1784). 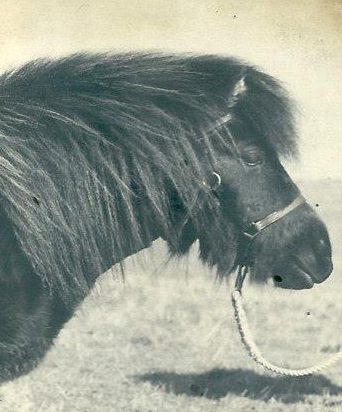 However, the lack of attention paid to his sketchbooks was highlighted during my period of working at Plymouth City Museum and Art Gallery (PCMAG). Reynolds’ sketchbooks from his period in Italy (1750-2) had a significant influence on his output on his return to England (1752), but they may also help to understand how he established himself as the fashionable portrait painter of the day. PCMAG acquired a Reynolds’ sketchbook (one of the last two remaining in private hands) by private treaty in 2014 through the Heritage Lottery Fund, the Art Fund, the V&A Purchase Grant Fund, and the Friends of Plymouth City Museum and Art Gallery. Sir Joshua Reynolds’s sketchbooks were compiled during his time in Italy studying Old Master works (1750-1752). The Plymouth acquisition acted as the catalyst for me to compare the four Reynolds Italian sketchbooks held at the British Museum (BM) (x2), Sir John Soane’s Museum (SJSM) and the one at PCMAG in regard to his portraiture completed on his return to London. Other sketchbooks are held in the USA in the Metropolitan Museum (New York), Fogg Art Museum (Massachusetts), and in the Beinecke Library, Yale University (New Haven). The BM sketchbooks were produced by Reynolds on his travels from Rome to Florence and then to Venice. The sketchbook (1859,0514.305) contains travel notes, drawings and notations relating to the works of Old Masters he viewed in Florence and on the journey from Rome to Florence, 1752. The other sketchbook (1859, 0514.304) contains notes and sketches, mainly from paintings and sculpture, made in the second half of 1752 on the journey from Florence to Venice. The SJSM sketchbook (SM Volume 32) derives from works in Bologna and Naples. This sketchbook numbers ninety-six leaves, bears the number ’63’ written on its vellum cover, and corresponds to the description of Lot 63 in the catalogue of the Marchioness of Thomond’s sale, Christies 1821. There is also a ‘smaller’ sketchbook held at the Museum, yet its attribution to Reynolds is in doubt. It was rejected by Ellis Waterhouse, who mentions only the larger sketchbook. The PCMAG sketchbook was created between 1751 and 1752, and contains 121 sides of drawings by Reynolds in pencil, pen and ink, and black chalk. It is bound in its original vellum binding and cover. 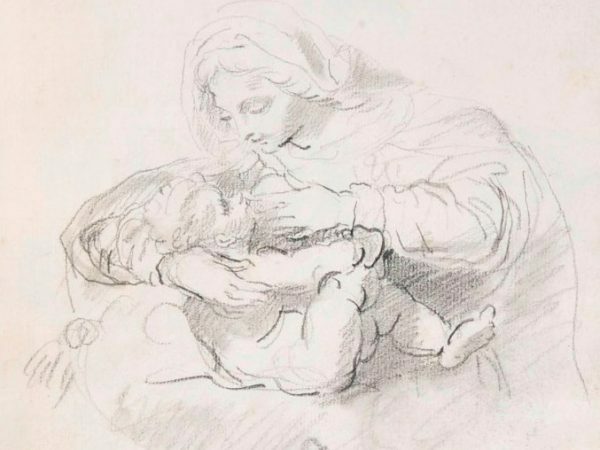 It was exhibited at the Royal Academy of Arts Reynolds exhibition (1986) as catalogue number 159, where Nicholas Penny recognised one of the drawings as a study of Correggio’s Madonna di San Girolamo (Galleria Nazionale di Parma, Parma). It is likely that the sketchbook contains drawings from Reynolds’ time in Rome (1751) and his journey to Venice, particularly Florence and Parma (1752). Overall, the sketchbooks reveal how Reynolds would focus on a particular aspect of an Old Masters work and sketch, what we presume for him, was the most interesting or useful aspect of it. In the case of Correggio’s Madonna di San Girolamo it is the character and composition of the angel holding the Bible before the Christ Child that most interested him (see above). One can assume that Reynolds knew of this work as it was famed throughout the 17th and early 18th Centuries as one of the most beautiful paintings created. Vasari admired the wondrous colour, the smile of the angel and wrote that it could cheer up even the most melancholy of observers. Interestingly, although the sketch is found in the PCMAG sketchbook (PLYMG.2014.72, page 36 verso) a reference is found in the BM sketchbook (1859,0514.304, page 12 recto) whereby Reynolds, possibly writing a letter draft, writes: “…you must ask to see the Holy Family with St. Jerom. It gave me as great a pleasure as ever I receiv’d from looking on any picture, the airs of the heads, expression and colouring are in the utmost perfection; ’tis very highly finished, no Giallo [yellow] in the flesh, the shadows seem to be added after by a thin colour made of oil and ultramarine, and sometime oil and red, no outline scar[c]e to the face especially the Virgins…the red mixt with the white of the face almost imperceptible…” This statement reinforces Reynolds interest in the techniques of the Old Masters, especially in their treatment of expression, colour and design. This initial preliminary research highlights a number of links between the Reynolds sketchbooks and their possible influence in regard to his portraiture. Reynolds’ Italian journey and the sketchbooks he created whilst on tour could be a major influence. To understand the major impact of the sketchbooks on the transitions in Reynolds’ work further investigation is required. The acquisition of the sketchbook has sparked my interest and has initiated a new area of research that I will take further to increase the knowledge of Reynolds’ work and of British portraiture at this time. The acquisition of the PCMAG sketchbook offered me the opportunity to initiate the broad scope of my research into Reynolds’ time in Italy and the influences this and his other sketchbooks had upon his work. The Bursary gave me the time to research the sketchbooks influences upon Reynolds’ work and the chance to develop my own research interests whilst working for PCMAG. I have been enabled to collaborate with other institutions and academics with similar interests. This opportunity has had a major influence upon my future research interests as I further progress this area of interest. I wish to thank the staff at the British Museum, Sir John Soane’s Museum, and Plymouth City Museum and Art Gallery, for their assistance with my research.